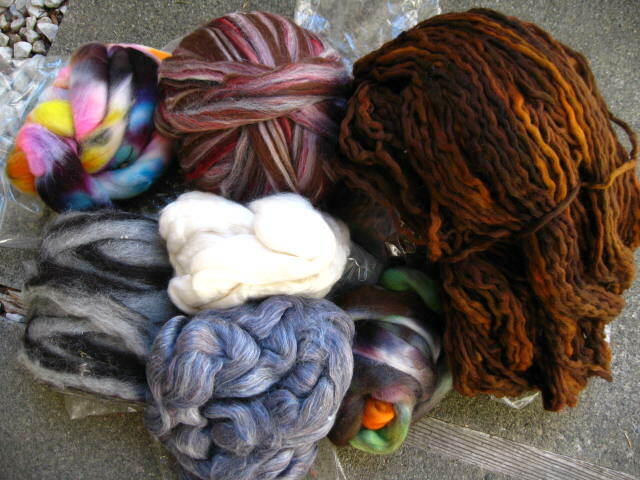 No, it’s not the walnut Fast Flyer I’ve been waiting for since FEBRUARY, a special order placed for me by my LYS. (Yes, I still plan getting it when it finally arrives.) It’s a …(drumroll please)… Very Fast Flyer! As I’m still commited to purchasing the Fast Flyer, I broke down and decided to order this even faster Lendrum Very Fast Flyer (in the walnut anniversary edition) from someplace online on a Monday, and received it, three days later. I didn’t order one of these before because of the prohibitive expense; it’s costly because it comes with an entire new mother-of-all and maiden assembly, with several specialised machined metal parts designed for yarn stability. The Very Fast Flyer was designed for very fine, thread-like yarn; and is not suitable for medium or larger thicknesses. Whoo Hoo! Such sssssssssspeed! Thus far, I’ve only used the slowest ratio of 26:1, which is 2.6 times faster than the fastest ratio on my standard flyer (10:1). I don’t know if I’m naturally a fast (some have said manic) treadler, or if I became that way to compensate for the slowness of the standard flyer. 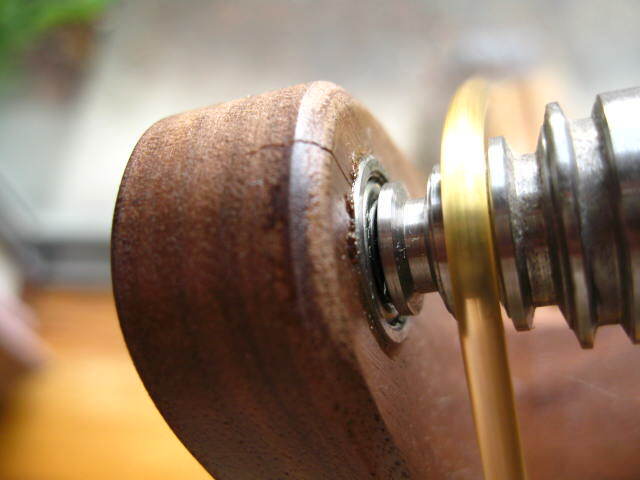 But, I am having difficulty slowing my treaddling so I do not continually snap the thread apart. Before, the standard flyer was too slow for my drafting. Now, I need to increase my drafting speed just to keep up with the slowest ratio on this new flyer; I haven’t even tried any of the faster ratios yet. 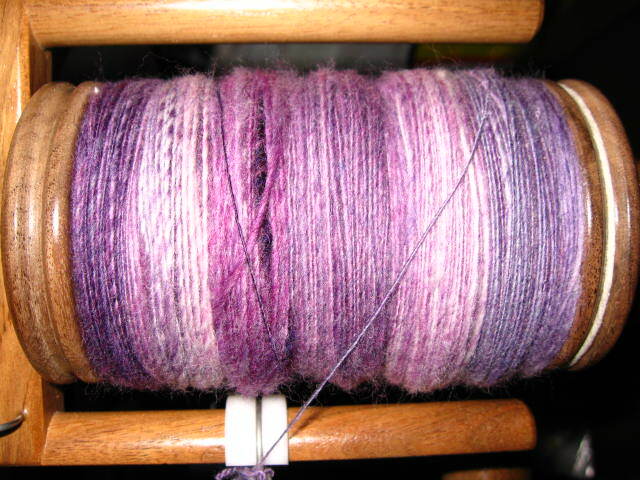 I suppose I’ll eventually get to the point where I can spin without snapping the yarn every five minutes. In the meantime, it’s very tedious to thread this this flyer, as all the points in the yarn path are teeny, teeny, tiny. Look how tiny and flexible the new threading hook is! 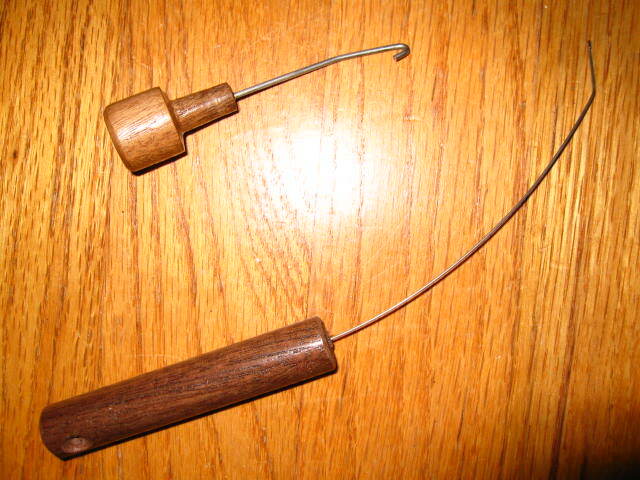 The original threading hook is shown (top , shorter hook) as well; the crook of the new hook is so small, it’s nearly invisible. I’m a tad disappointed that the new mother-of-all does not have an opening to store the new threading hook as did the original. It is annoying to always be searching for where I last set it down. And notice how small the bobbin capacity is! Unless spinning a sewing thread’s thickness, this will fill up quickly. (The larger core aids in yarn stability.) I have only the one bobbin at this time, so my new bobbin-winder will come in handy! If not for the picture taking, I may never have noticed the flaw until too much time had passed. I’ve contacted the store that sold it to me, and Mr. Lendrum will make me a replacement. Until then, I have the use of this unit. 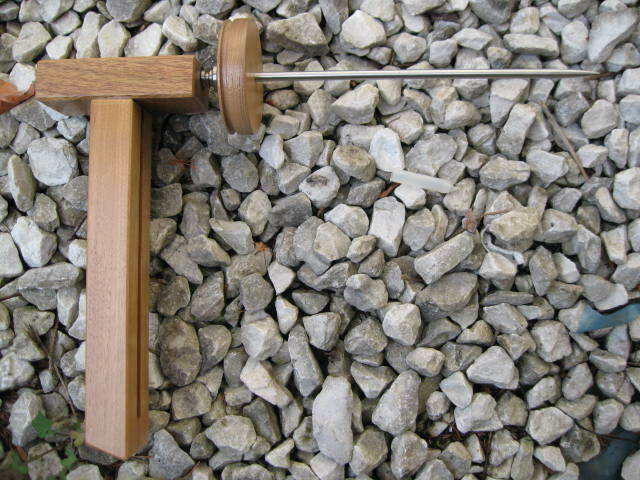 I have not put in any quality spinning time this past month because I was so bothered by the lack of speed; so I’m looking forward to spinning ramie (shown in the pics) to make loom tie-up cording soon. Go, Speed Racer — Go, Speed Racer — Go, Go, Go!!! I decided to finish off the woolen (attenuated long-draw) started in class on Saturday. Pictured above, the last of the rolags I had from class. Shiori prepared them from dyed superwash merino top; it’s sooooooo dreamily soft. Shiori makes exceptionally lovely, dense, and fluffy rolags. She calls them “punags”. (Punis are the dense preparations of cotton for spinning.) 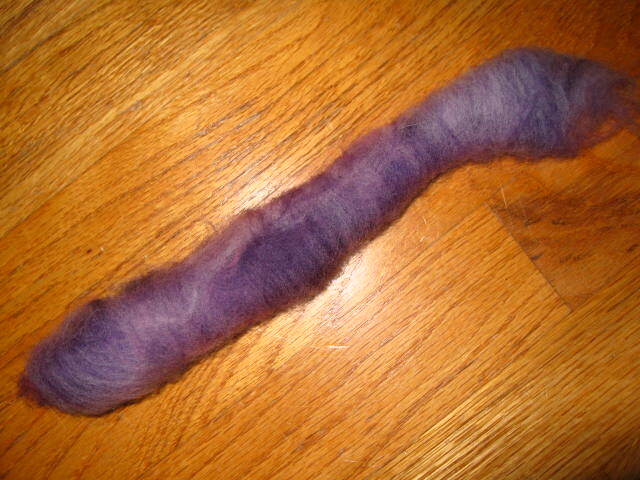 Rolags are so fun and fast to spin, I had to force myself to stop spinning to take this picture before it was gone. 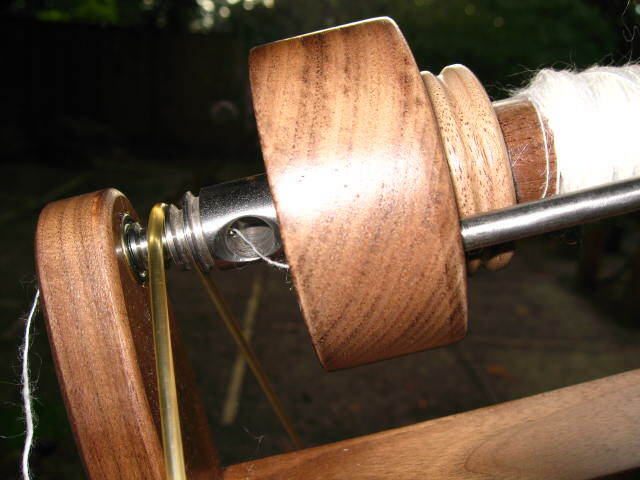 My singles wound onto three bobbins for plying. 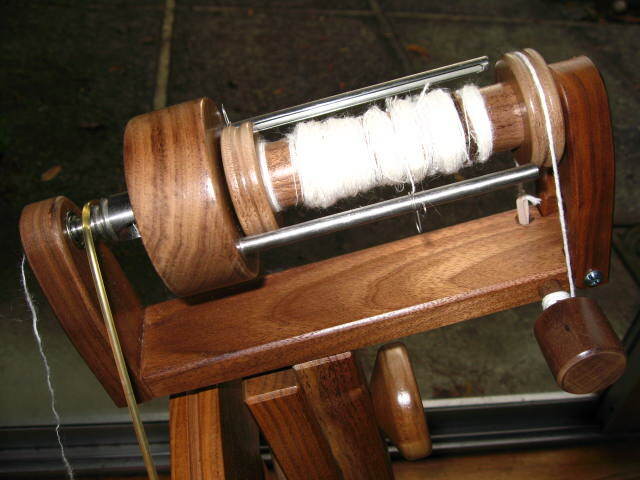 The three-ply in progress on my spinning wheel. This is the skeined yarn, pre-wash. It’s a lot more twisted than I used to do. 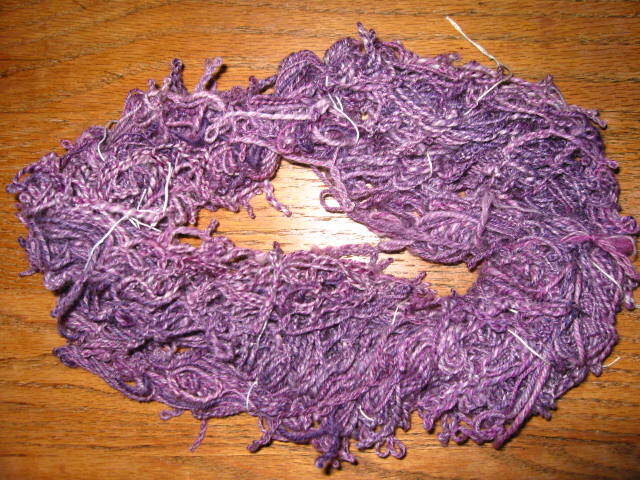 I used to produce a more “balanced” yarn pre-wash. I had read somewhere that this was something to aim for. But Judith MacKenzie set me straight on that. It’s actually better to be over-twisted, since you would lose about twenty percent of that twist in the washing/finishing stage. Also, the way we handle yarn in knitting can also take twist out of the yarn. I’ve experienced that before, especially when I’ve frogged a section more than once. Lastly, it’s better to have more twist to give the yarn more strength if the end product is for weaving. Still, I overdid the twist here, and will back down a bit in the future. My theory is, a more “balanced” yarn plus a little extra for the handling during knitting in the pre-finished stage would be more wash-friendly in the final product. If a lot of fulling, wuzzing, and whacking of the yarn is put into the finishing, I’m guessing that the knitted product would retain more of its pre-wash shape. Anyway, just a theory. I’ve only two knitted FO’s at this point, neither using my handspun. Finished and re-skeined. My son calls this colourway “purple grapes”. I have to invest in a small plunger to full the yarn as Judith does. I did the fulling by agitating the skein by hand in the hot wash, and I’m surprised this didn’t end up felted into a ball. 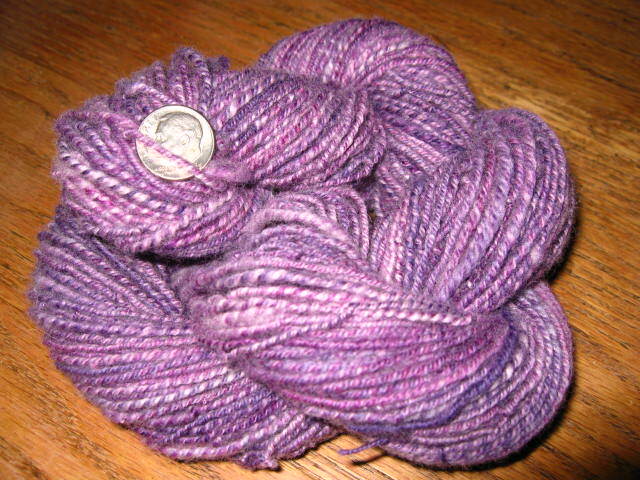 It’s 135 yards, 2.25 ounces, 23 wpi, superwash merino three-ply. Judith says that a three-ply yarn should be our default. Not only that, we should use three bobbins, and not Navajo ply for a better yarn. I must say that it’s worth the extra work. 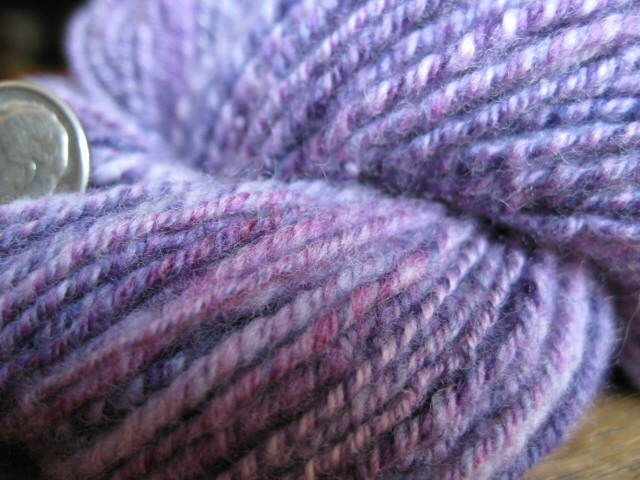 The finished yarn has a lovely, rounder shape. Since it’s a woolen and quite springy, I think it’s better for weft than warp. 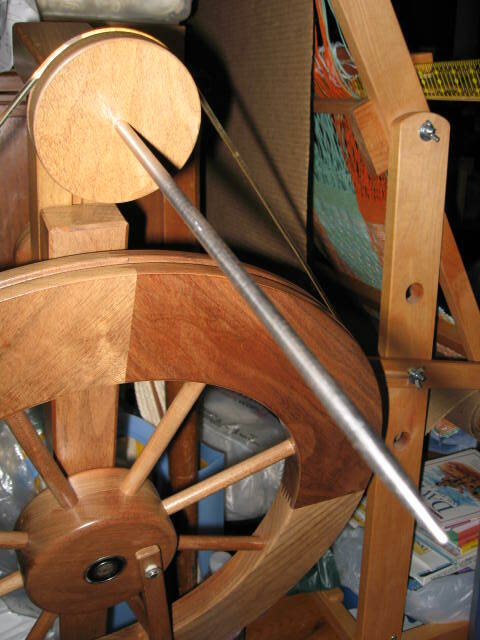 I’d spin worsted for warp. I couldn’t resist; it was a bargain, and it came with two dozen cards. I have an unused set of tablets and a pamplet I bought from Linda Hendrickson something like ten years ago at a Seattle Weavers’ Guild sale. 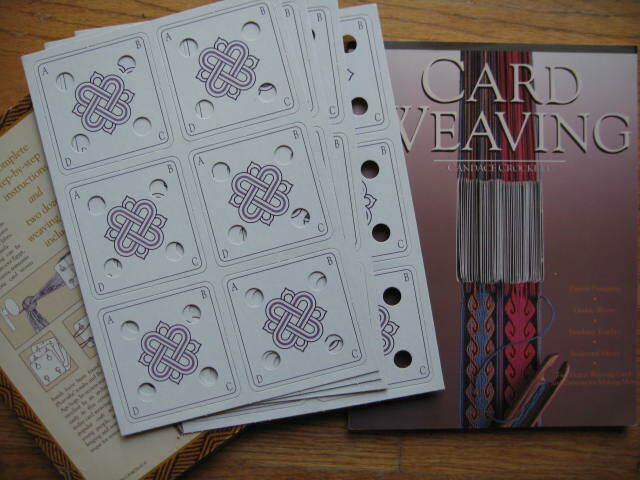 Now that I’m in the weaving groove, I believe they will see some use soon. 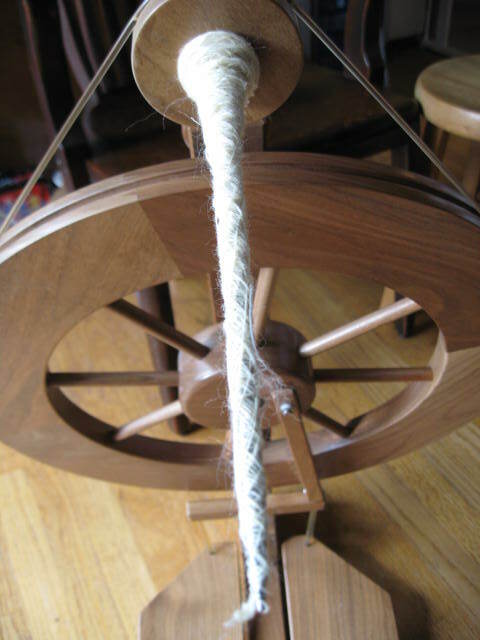 I took a class yesterday (Comprehensive Spinning) led by Shiori, of our Eastside Spinners’ Guild. Although I heard about all the techniques from the class I took from Judith MacKenzie, today’s class with three instructors was very helpful in helping me understand and retain what I got from Judith. I finally understand true worsted spinning! 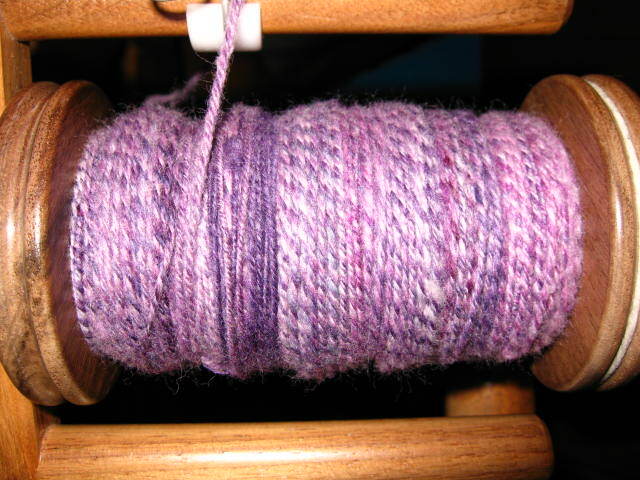 By the end of class, I was able to spin true worsted, semi-worsted, semi-woolen, and woolen. I also know the difference between a true English long-draw and an attenuated long-draw. 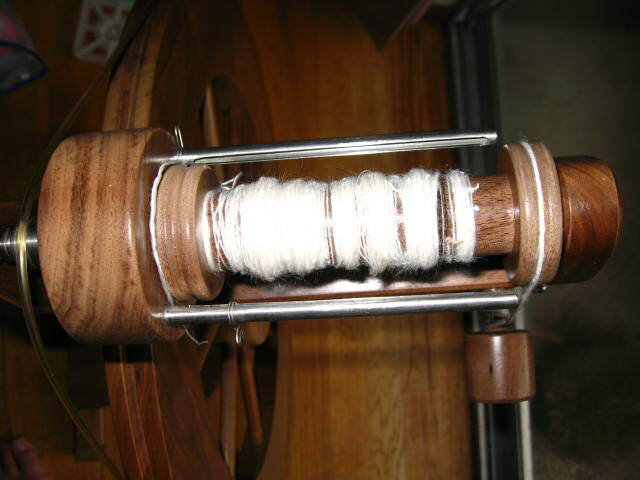 Here is my bobbin filled with class exercises. An unexpected bonus at the end of class: Shiori put a mountain of stuff in the middle of the room and invited the students to take it all home. We were very happy to relieve her of unwanted fibre! Before heading home, I made a stop at the home of another weaver who sold me thirty-one cones and twenty-six skeins of yarn (the skeins include sixteen blue cotton novelty/bouclé and five cream cotton novelty). 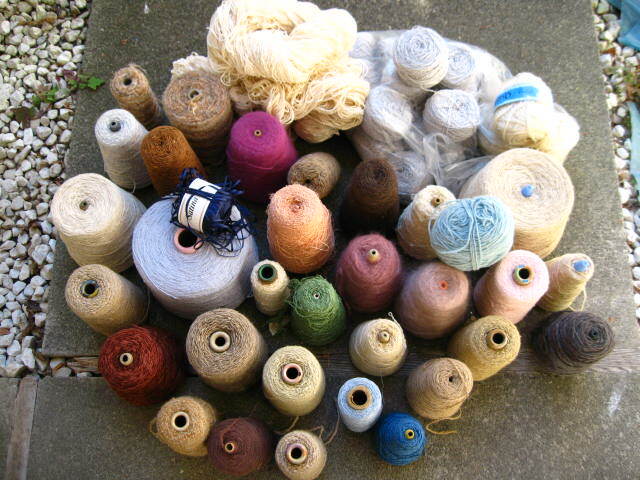 Most of the cones are either silk, wool, mohair, or cotton. Fifty dollars. The huge light blue cone is two pounds of silk. A mammoth moving box of all the cones is sitting in my house entryway. I have no idea where I’m going to put it. Someone once told me that we attract what we think about. I’m going to suspend thoughts of “fibre” and start thinking “larger house“.